Hotel Londra , 4 stars in Milano Marittima, a few steps from the sea, has parking, WI-FI connection throughout the entire hotel, air conditioning in the room, the possibility of wellness services and beauty treatments. The property accepts small and medium-sized pets. Facing the beach, in a privileged position. Behind the hotel there is a large and wide pine grove, while a short walk you can reach the center of Milano Marittima, where there are clubs, restaurants and shops. All rooms have a balcony, air conditioning, WI-FI, satellite TV, telephone, safe, minibar on request, bathroom with shower and hairdryer. FAMILY ROOM: 2 connecting rooms, one double and one twin, 2 bathrooms, balcony and sea view. PENTHOUSE: large balcony equipped with sun loungers, overlooking the sea. The property has a garden, a open-air porch, free bicycles, a reading room, a TV room, a large living room, a lift, a beach towel and daily newspapers, and massages and beauty treatments. PARKING: uncovered, free and available to all. WI-FI: free in the whole structure. CONVENTIONS: beach, amusement parks, discos, gym, swimming pool. PETS: free of small and medium size. BREAKFAST: sweet and savory buffet, homemade pastries. LUNCH AND DINNER: menu with 3 or more choices, buffet of vegetables and appetizers. VARIATIONS: vegetarian, vegan, for celiac. OTHER: evenings with typical Romagna menu, aperitif in the garden, dessert buffet. In the hotel: playground area, entertainment, mini club, strollers, pediatrician and baby sitter both on request and for a fee. In the room: bed rails, cribs, bath tubs, toilet reducer and bottle warmer. At meals: baby menu, baby food, flexible hours, seats at the table, afternoon snack. On the beach: playground area, entertainment and baby club. 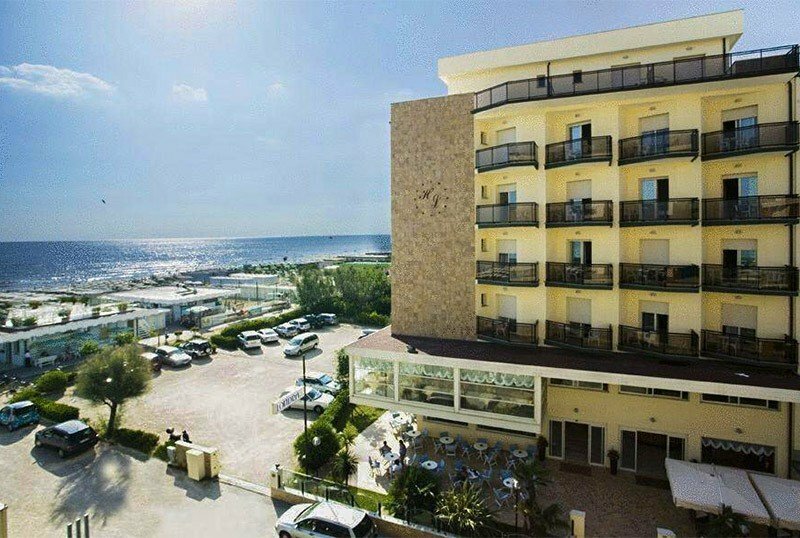 Hotel Londra has an agreement with 2 bathing establishments: Bagno Dario, in front of the hotel, with hot tubs, sports activities, mini-club, games for children, entertainment; and the Bagno Holiday Village, not far away, with two heated swimming pools, water activities, wellness area and 2 bars. For the latter a supplement of 9 euros per day is required per room. List prices are per person per day in full board and in a double room for a minimum stay. of 3 days. The All Inclusive supplement is intended per person per day. TOURIST TAX: Excluded from the price list. € 2.00 per person per day (April-May-September), € 2.50 per person per day (June-July-August). Valid for a maximum of 7 consecutive nights, excluding children under 14 years. ALL INCLUSIVE: Full board + Water and house wine with meals + Beach service (two beds and a beach umbrella per room minimum stay 3 days) + Use of beach towels. - Reservations are considered valid if followed by a confirmation letter with a deposit.